Slim is newer. As the diagram shows, there is very code on the SUT. This is because all the table processing is done inside FitNesse, within the Slim runners. The Slim Executor and the fixtures are the only code that lives on the SUT. The Slim Executor is very small and easy to port. The Test pages are broken down into simple instructions by the Slim Runners. Those instructions are passed to the Slim Executor which directs the fixtures to call the SUT. 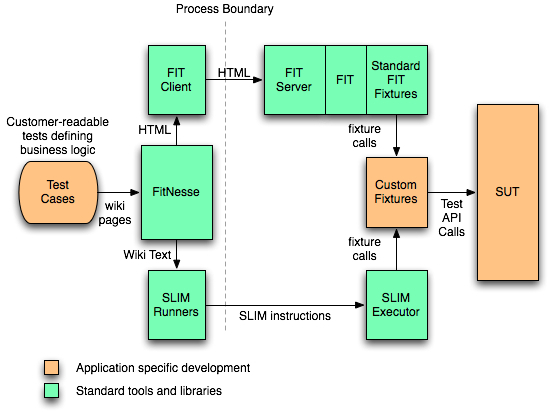 This means that new features added to Slim Runners will not require changes on the Slim Executor, and that all test pages written for a Slim Runner will work on any different Slim platform. You can read about Slim here. You can read about Fit here.